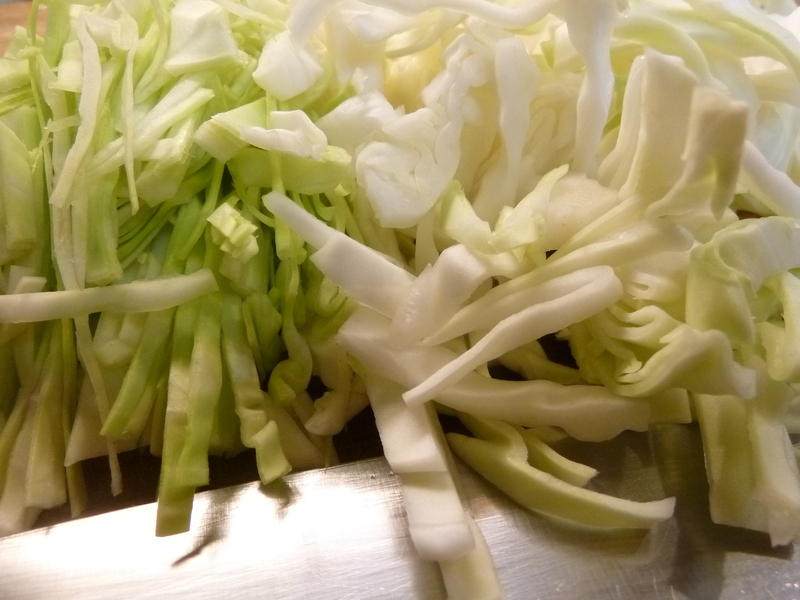 Bunching onions, sauerkraut, local lamb roast, and working in the garden…. What do all those things have in common? …. Just more “not dabbling in normal” normal. Over at the neighbors getting things ready to plant. Cleaning and clearing out the winter garden. the onions are starting to flower. I let a few turnips and some of the kale flower so I can collect seeds. The monster spinach is just starting to bolt, so will leave a few plants in the ground for seed saving also. I was over at the neighbors yesterday to help clear out winter plants and get some spring things in the ground. He uses a hoe (made in the USA) that belonged to his grandmother. 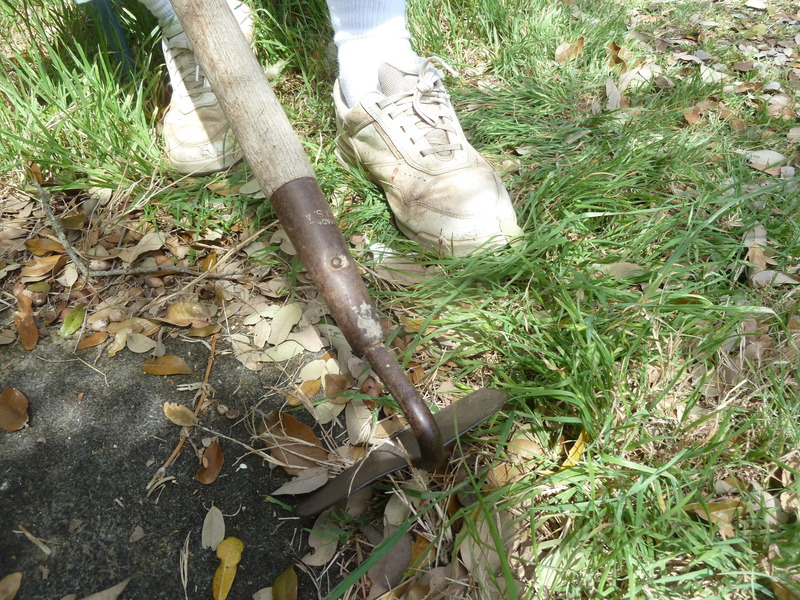 (my neighbor is 81 years old, so that is one old hoe that he is using.) we planted some cucumber and zucchini seeds and got a few bell pepper plants in the ground. My body is still playing catch up from being sick a year ago…. so that was all we got done. We will work out there again on Saturday. I plan to work in my garden today and hopefully get some plants in the ground. I still get out of breath, but it feels good to work out there and I need to keep pushing myself a bit to keep getting better. I have certainly come a long way, especially when i think back to march 2013 when I couldn’t even walk across the room! I have picked my cabbages and they are in the crock turning into fermented sauerkraut. I picked up some more local cabbage at the local swap that I go to and those are also fermenting in another second crock. 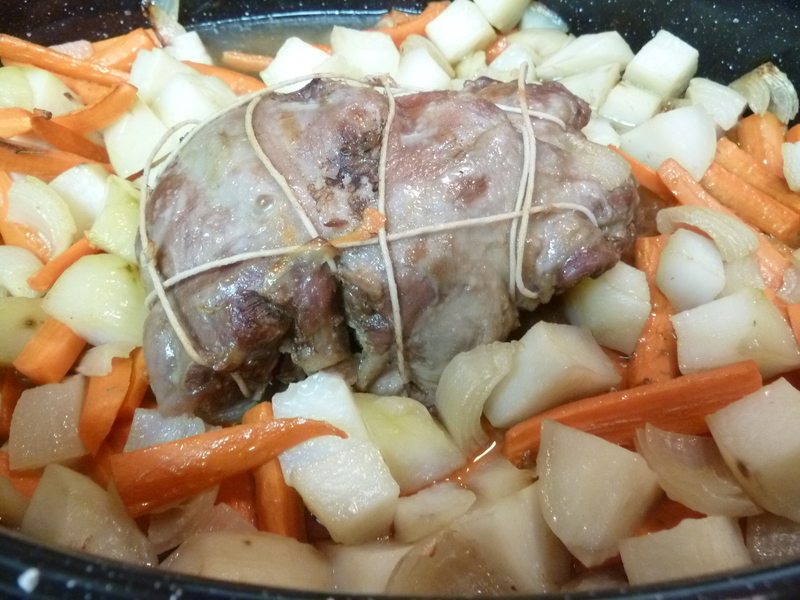 Dinner the other night was a roasted local lamb shoulder (picked it up at the swap/barter.) I had a second pan in the oven roasting sweet potatoes and onions that I also traded for. I am also taking an herbal medics class. Learning a lot, and So much more to learn. It is a lot of fun. 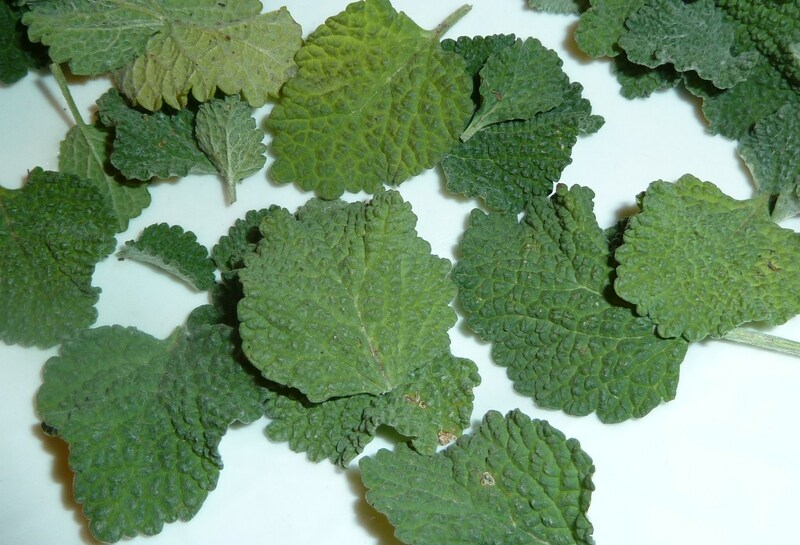 I am harvesting some wild herbs and edibles as they are popping up this spring. The lambsquarter is popping up so I am potting some up to take to plant swaps and also the month swap/barter. What are you up to this time of year? The following information is important for all pet owners to read, so i hope you will forgive this re-post from Pocket Pause. Today’s post is a very important message to all the skin-parents out there. A friend of mine recently sent me an email warning me about using essential oils on Pocket. 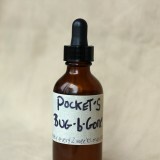 As i posted recently, i have blended an essential oil mixture to use on Pocket to prevent fleas, ticks and mosquitos without relying on those nasty chemical treatments. I’ve been using it with good success, as an occasional neck drip but mostly as a “rub it around on her belly and tail feathers” barrier when we go hiking. She’s had no problems, but i was also careful to dilute the essential oils i used with a lot of jojoba oil. It’s very important to remember that essential oils must ALWAYS be diluted before use, for humans and pets alike. There are a few exceptions that can be used undiluted on occasion, but as a general rule you should water down your essential oils in oil, vodka or witch hazel. Be very, very careful when using essential oils on Pocket. I honestly wouldn’t recommended it at all. I used Sentry brand “Natural Defense Flea & Tick” squeeze-on treatment, as well as the same name carpet powder. The ingredients are peppermint oil, cinnamon oil, lemon grass oil, clove oil and thyme oil. Within one day of treating Tres, he was having severe difficulty breathing. I wondered if it was the flea treatment, but thought that it would be strange if any of those ingredients caused him harm, as I thought they were safe (which is why I used it, as opposed to a chemical treatment). Well, three vets and four days later, we finally found a vet who had seen this before and read studies on it and, yes, essential oils can be toxic to dogs and cats. Their bodies metabolize them differently than ours. Tres’ rapid breathing was caused by his body being so acidic that it was toxic from the oils. His body was trying to get lots of oxygen to help his liver and kidneys eliminate the toxins. It has been nine days and his breathing is still not quite normal. But it is better. He wouldn’t eat, he could barely walk and he sounded like he was hyperventilating. It was HORRIBLE. I would just lay in his kennel with him and sob. The vet said we are lucky that he is still alive. The only thing we could do to treat him was wash him with dish washing detergent (4x) make sure he had plenty of clean water, high quality protein (he would barely eat though) and lots of rest. And 12 mg of Benadryl twice daily. We go to the vet next week to do blood work to see if there has been any permanent organ damage. We’re hoping and praying that there isn’t any. I’ve called the company and they refuse to acknowledge that their product could have done this. I find that interesting, considering that I found 200 complaints about their products killing/harming dogs and cats at the Consumer Affairs website and there is a Facebook page of people with similar experiences who are gathering up in order to file a class action lawsuit against the company. It is going to cost $400 to get our area rugs cleaned (I used the powder on them) and we’ve incurred a few hundred dollars in vet bills so far. Sentry says that they will do an investigation and “possibly” refund us for costs incurred. PLEASE pass the word on to all of your friends and family with beloved cats and dogs. Products with essential oils are even more harmful to cats, as they clean themselves and ingest them. The best flea treatment to use is Frontline Plus. Scary stuff! Please be careful when using any medication on yourself or your pets, natural or chemical. Also avoid clove oil like the plague: it is intensely volatile and dangerous even to humans if undiluted. Use it on your gums, carefully, but keep it away from the pups! 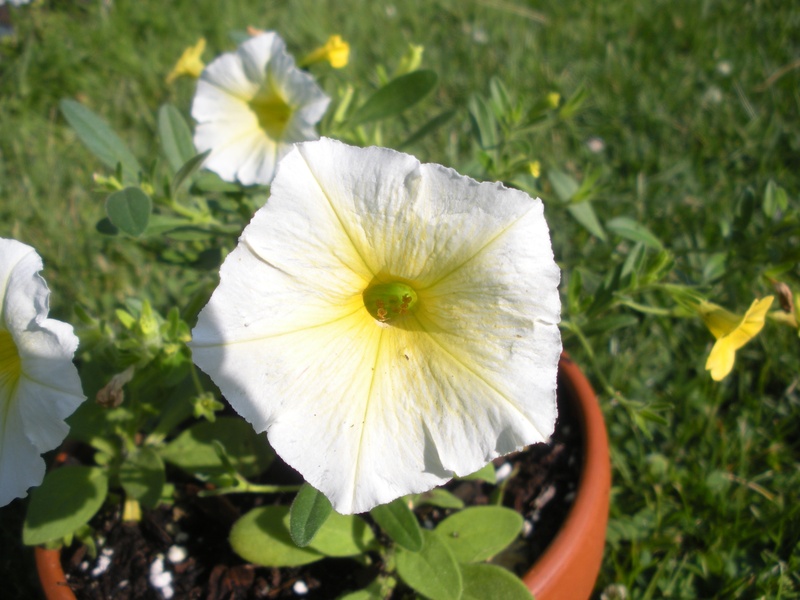 Prevention is always the best policy: plant flea and mosquito preventing plants in your landscaping like pennyroyal and catmint, brush and pick over your pet often to see if fleas are even a problem and always be careful when using a new product on your pets as they may respond differently than you’d expect. I like to mix a carpet powder for home use that should be safe for everyone involved: a blend of 60% baking soda and 40% diatomaceous earth plus a few drops of essential oils for the scent. The b.s. freshens the house and the d.e. helps kill unwanted pests. 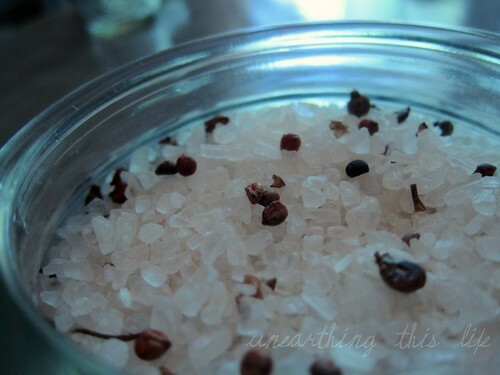 I’ve also heard from a reader that you can shake salt all over your house and let it sit for a day before vacuuming…. that sounds a little messy but very safe. I was knocked down by yet another cold this season. This is hard for me to wrap my brain around (especially in the cold-induced foggy state.) I have been healthy and cold free for about 2 years and this year is completely different. I have learned a lot over the past few years about herbs and foods and characteristics that are helpful, but I have also found that my best intentions haven’t prepared me to fight these colds. I want to grow elderberry bushes so I can make immune boosting syrups and tinctures and even wine. 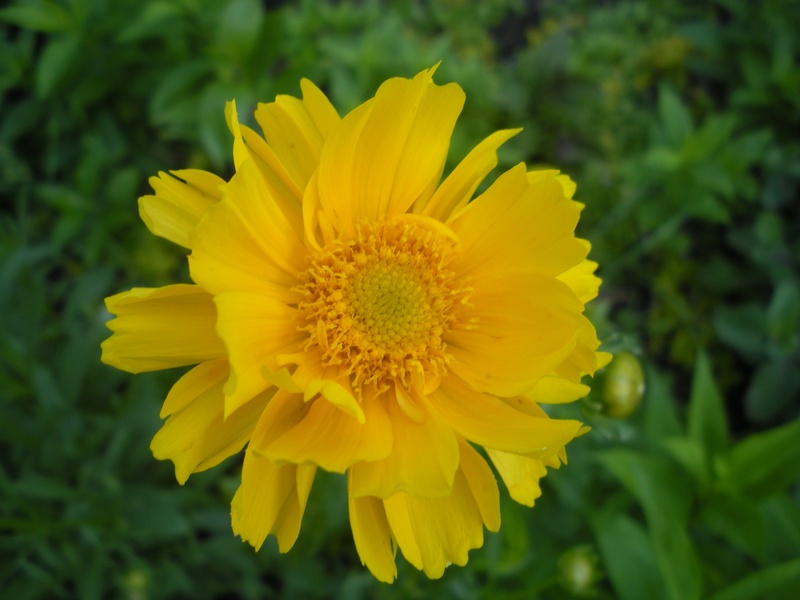 I want to grow calendula and chamomile, horehound and stinging nettles. I want to grow sumac and dandelions and ginger. I know I can grow these things. I have a few growing now. It just takes time and I have to realize that I can’t do it all overnight! Even though I can and will grow these things, it isn’t practical to think I can grow and make my own “everything” all at once. I need to step back and realize that I can (and should) buy some of these wonderful dried herbs and fruits and just start making the tinctures and syrups and throat lozenges so when I am hit with a cold I am prepared. When my bushes and trees and herbs mature I will then know what to do with them and be thrilled I can use my own. There are a few things I did during this last cold that helped me to fight it off faster. I drank hibiscus tea and I also drank garlic tea. 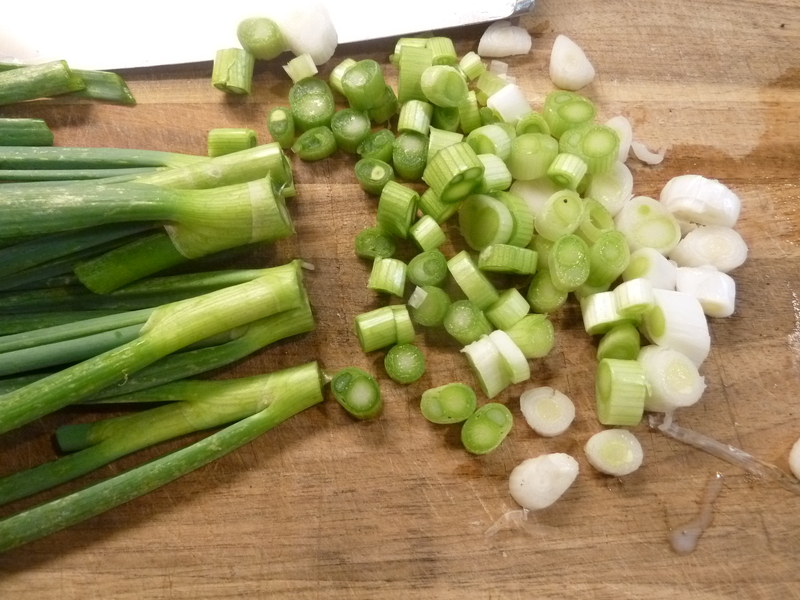 Garlic is chuck-full of great antimicrobial and antiseptic properties. I cook with garlic a lot, but drinking the garlic tea is another way to get it into your system and help fight off the effects of the cold or flu. 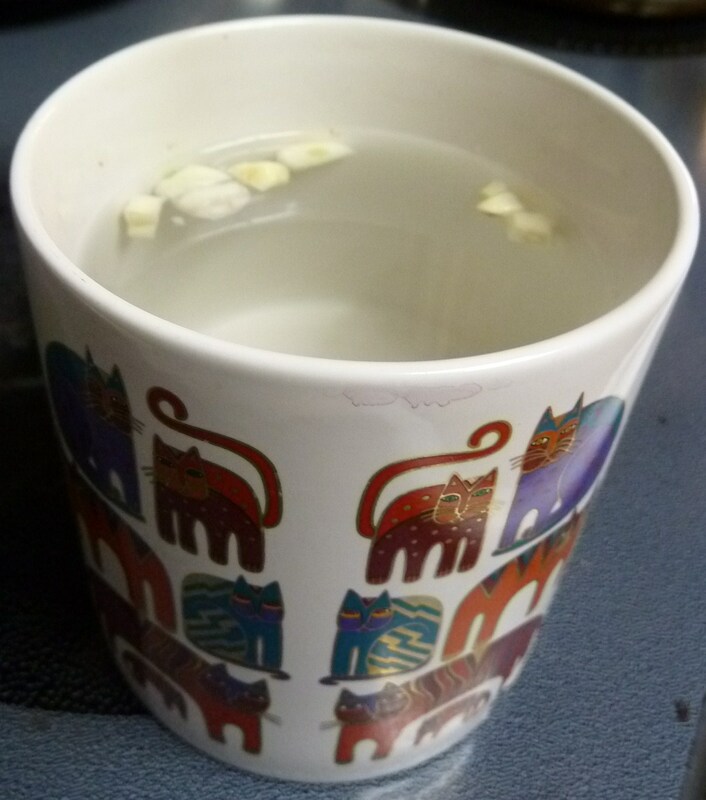 You can read about garlic tea right here at Not Dabbling in Normal. Along with losing my appetite I also lost my sense of taste and smell. To help get me through this cold I made a healing chicken soup that I know helped nourish me and get me through this much quicker. I made a bone based chicken broth and threw in ginger, onion, hot peppers, dark leafy greens (kale and chard and spinach), turmeric, and garlic along with basil, oregano, thyme and parsley. I wasn’t really thinking about taking photos while I was sick, so the photo you see below is the second batch of soup I made when I started to feel better. This past week I got together with a culinary group I belong to. The theme this month was “soup.” One of the ladies brought an “Immunity-Boosting Winter Soup” and it was the first soup I ate that night. 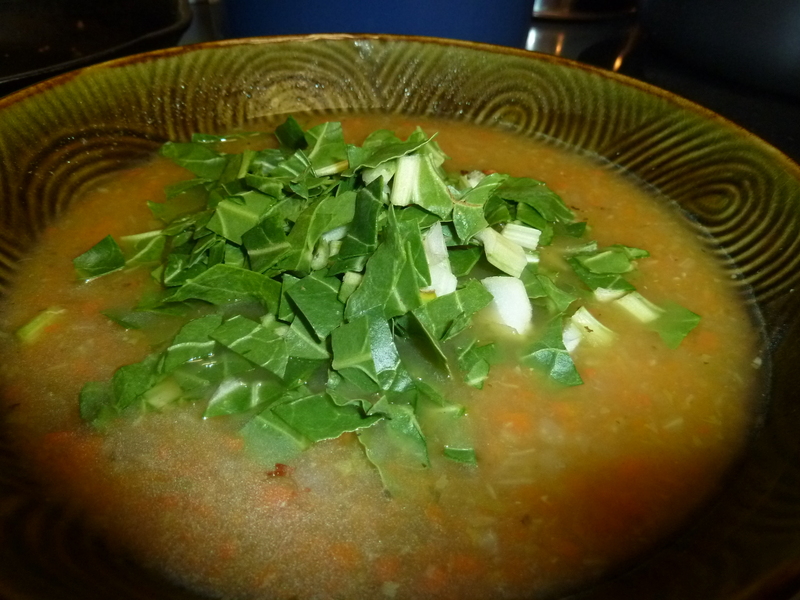 It was so much like the one I make, but hers included freshly harvest dandelion greens. We talked about her soup along with the ingredients and the properties that each ingredient has. I was thrilled to know I was on the right track with my soup. What went into my healing soup? I am back on my feet and the fog has cleared. I attribute that to the things I ate and drank. Now I better start making a list of things I would like to order so I can get some syrups and tinctures made up to help keep my immune system in tip-top shape. Do you have any herbal or home remedies that work for you? The end of cool, spring days are long gone here in the southeast (and most of the Midwest for that matter), and we’re working our way into a hot and dry summer. Though the days may be thick with heat, we’re fortunate that the fragrance in the air is sweet, making odoriferous (read: sweaty) outdoor life a little more bearable. Between the honeysuckle, magnolia blooms, the last of the spring roses, and now elderflowers (also known as Sambucus), the perfume outdoors is downright heavenly. In the past I’ve talked about elderberries, but the flowers that make those berries are just as – if not more than – extraordinary, and dare I say: exquisite. If you’ve ever had the opportunity to sample the blossoms in liqueur form (aka St. Germain) you’d recognize the slightly lemon and honey undertones in the air. It’s a sweet, heady, and perfumed flavor, but not quite cloying. 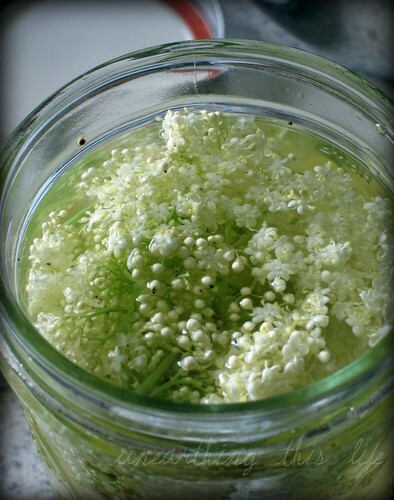 Elderflower liqueur or syrup is definitely spring in a bottle. The liqueur or syrup is gorgeous mixed with champagne, it makes a lovely iced tea, and numerous other cocktails. Just don’t consume too many or the alkaloids will give you an upset tummy*. If you do happen across some elder, be sure to leave plenty of blossom heads to produce berries in another month, and then leave some of those berries for wildlife and to produce new shrubs. The berries are an important resource for many critters including birds and many moths. 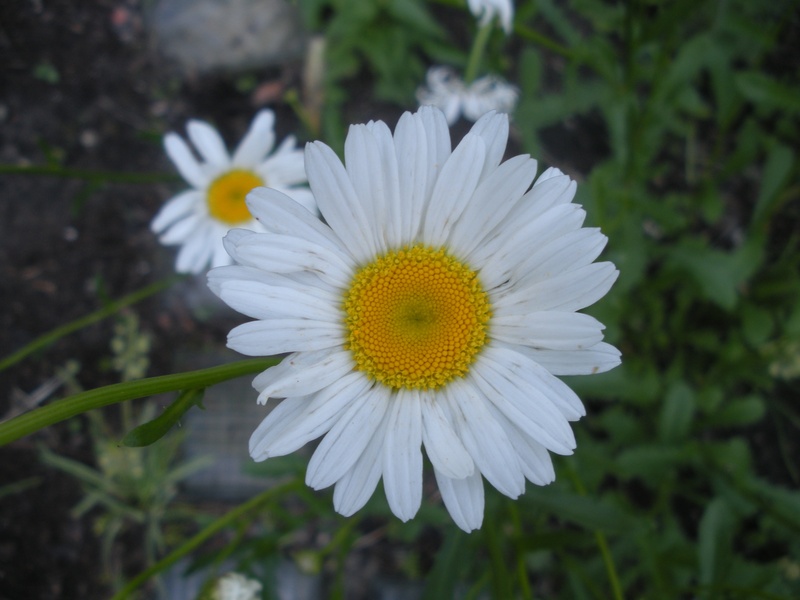 Pick the blooms that are open as it’s the pollen that helps to flavor and color your cordials – avoid those that are already forming berries and blossoms not yet open. Bring water and sugar just to a boil, then combine remaining ingredients. Allow to steep for 12-24 hours. Strain through muslin, then bottle and keep in refrigerator for up to a week. way to extend the life of your syrup which will last about a week in the refrigerator. 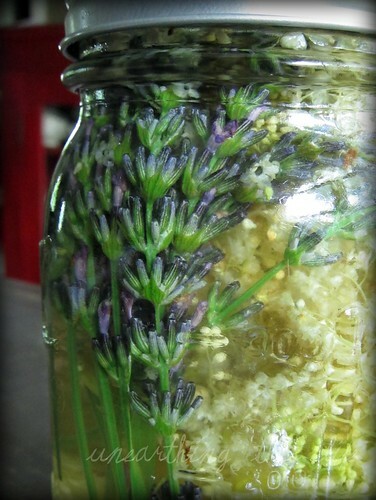 Follow directions for Elderflower syrup, but add 5 stems of lavender to 1 pint of liquid. Strain through muslin before bottling. Strain vodka through a water purifier if you have one available. Put flowers into quart-sized jar then cover with vodka. Allow to steep for about three to four weeks, then strain through muslin cloth. Return vodka to jar and add sugar. If 1/2 cup isn’t sweet enough, add more. I’ve got all of these above in process currently. Next up is a recipe for elderflower& vanilla panna cotta I found at the River Cottage blog. The apple elderflower jelly and the strawberry elderflower jam both sound divine but I’m afraid those will have to wait until next year because I’m reserving the rest of the flowers for elderberry jam! The leaves, twigs, branches, seeds and roots contain a cyanide producing glycoside. Ingesting any of these parts in sufficient quantity can cause a toxic build up of cyanide in the body. 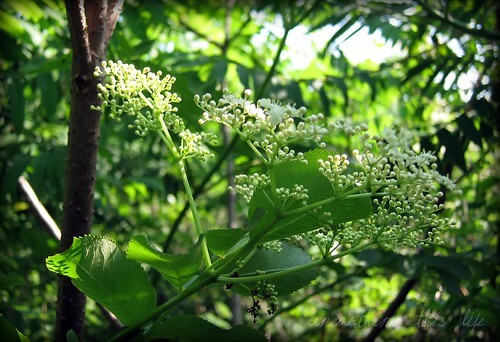 In addition, the unripened berry, flowers and “umbels” contain a toxic alkaloid. 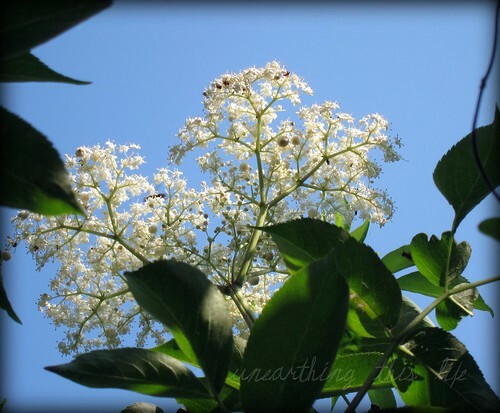 Information and history of the Elder via the USDA plant guide. You can also find Jennifer blarging along at Unearthing this Life when she’s not too busy wrassling turkeys and guineas, chasing chickens, playing with a seven year old, and working her (now) massive garden. She even sometimes tweets her nonsense @unearthingthis1 on Twitter. Being a gardener, a mother, a housekeeper, a homesteader, and if there’s time left over – an artist, I always have rough hands. On top of all that, I suffer from eczema from time to time and have dry skin. We joke about it at my house: that I have “manlier” hands than my husband. Admittedly I’m not always the best at donning gloves when I’m working outdoors. In the winter time and early spring, my hands would chap so bad that they’d bleed. Switching from anti-bacterial soaps throughout the household helps tremendously. 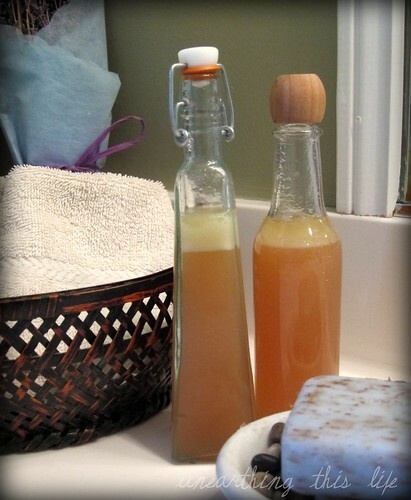 I also stopped using mineral oil-based lotions and switched to those made with beeswax and other healthy emollients. With our focus this month on REAL clean items, I thought it’s time for me to work on making some of my own lotions, scrubs, and oils in an effort to save money and concoct some brews with my very own herbs and blossoms. 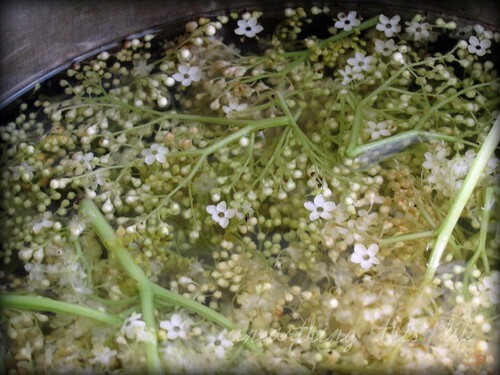 I have to tell you that the process has made my house smell amazing – that in itself is worth the whole thing! 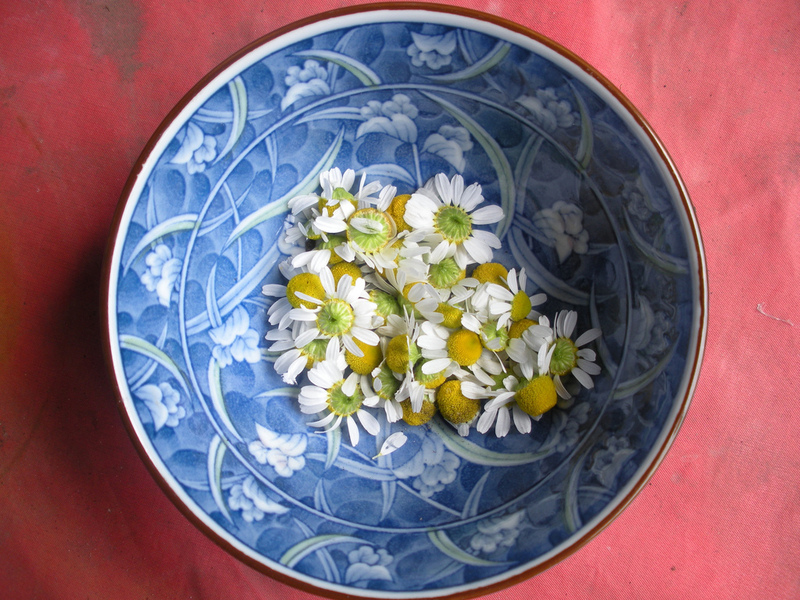 Start by making an infusion of your desired herbs or flowers. 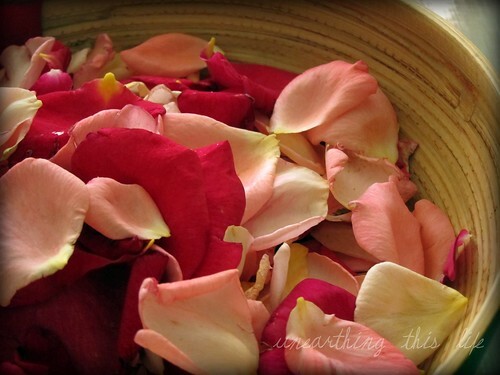 I used rose petals because they have a skin-softening effect and lavender because it’s my favorite aroma. You can also use violets and chamomile for a soothing blend. I wanted my infusion strong, so I used equal parts rose petals and distilled water, then tossed in several lavender stems and branches. Cover and heat on medium for about 1 hour, but do not boil. Allow to cool, pulling lid off every few minutes to gather evaporated goodness in an atomizer to spray on linens. Strain liquid and store in a dark jar. I ended up with 6 cups of the infusion which will last a very, very long time. I’ll keep it in the refrigerator and use as a cooling spray during the summer, or to mix with iced tea, or to make more balms and lotions. Add all ingredients to a mason jar and shake vigorously. This will not emulsify completely, so you will need to pour into decorative jars quickly. Shake again before using. My first impressions: My skin feels incredibly soft and not oily in the least. And the fragrance… not the least overpowering, although I may stay away from my beehives today. Those have always been rough. I have to keep them constantly exfoliated to keep them smooth or they snag everything they touch. For the holidays I made my family and friends a foot soak and scrub that is a great exfoliator. Last summer I’d made some grape jelly from Concords, and saved the seeds for this purpose. They make an excellent scrub, but remember that you’ll want to strain them from the water as they may clog your drain. Add them to your compost pile instead. Combine all ingredients together in an airtight container and label. 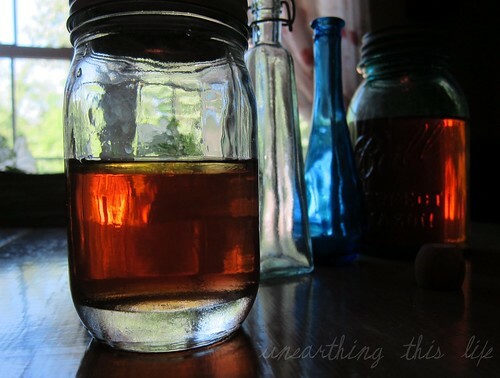 Allow to rest in a dark room for several days before using so that the oil infuses the salts. As the month progresses I plan to experiment a little and actually use my own products. At the end of the month I’ll report my results to see if they’re any better than over the counter items. You can find me at Unearthing this Life where I blarg about living in rural Tennessee. I’m also on Twitter as @unearthingthis1 . Several years ago I read about the wonders of Broad Leaved Plantain, a “weed” that grows everywhere. It’s also known as: Bird’s Meat, Common Plantain, Great Plantain, Rat-tail Plantain, White Man’s Foot. 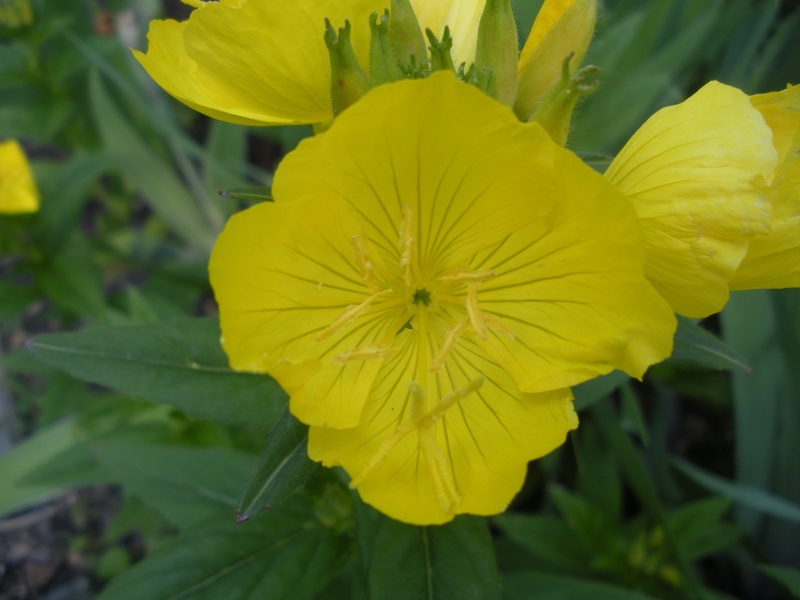 I have it growing all over the gardens here at Chiot’s Run and I’m quite happy about it. It comes in very handy when I’m out working late and get bit by mosquitoes or if I get stung by a bee. What I usually do is take a few leaves, cut them finely, add a pinch or two of baking soda and a little water. Then I grind them to a wet paste in my mortar & pestle and apply to the bug bite. It instantly works to get rid of the itch or sting and keeps it coming back. This salve is also very beneficial for using on cuts and scrapes, I often add some turmeric and comfrey when I’m using it for this purpose as turmeric helps with inflammation and pain and comfrey speeds healing. Plantain has medicinal uses of all sorts: bites, cuts, scrapes, rashes, skin problems, intestinal pain & issues, worms, boils, bronchitis, coughs, colitis, hemorrhoids, diarrhea, dysentery, vomiting, bed wetting and incontinence and many other things (for more info read this and this). I have yet to use it internally, but I use it often for bug bites, stings and cuts. I’m trying to make plantain oil for using medicinally. Since it’s an herb with no known side-effects I definitely want to try using it more often. Have you ever used plantain? 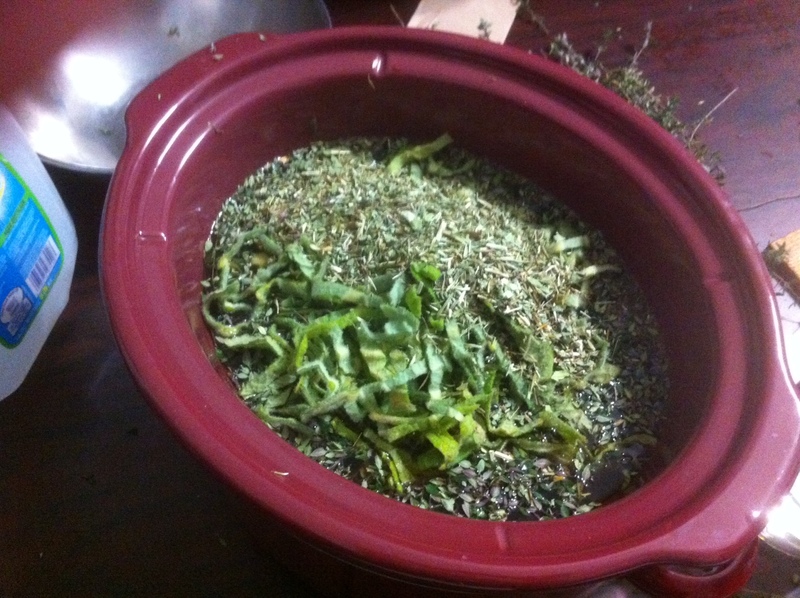 Do you use herbs/weeds for medicinal purposes?